North of I-10 between Antoine & Wirt Rd. Over 3,100 Fans, Thank You! We offer a large selection of exotic birds commonly kept as companion or caged pets, cages, food, toys and related supplies. We provide grooming as a service. Our usual grooming includes trimming the toe nails and clipping the feathers of one wing. If you have a preference for wing feather clipping please state that at the time of grooming. If needed, beak grooming is available for $15.00 per bird. For grooming, please bring your pet bird in a suitable carrier. Leave the bird in the carrier and let us collect the bird for its grooming. We provide boarding as a service. We will provide a cage and attend to the bird while in our care. Our boarding rooms are away from our bird show room and each customer’s bird is caged individually (unless you cage more than one of your own birds together). 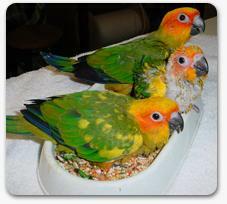 Birds and Plants.doc Plants considered safe around your pet bird.